You can use DataMigrator to build data flows ranging from the simple, where data is moved from one source into one target, to the complex, which employs multiple sources and targets and a variety of data extraction techniques. 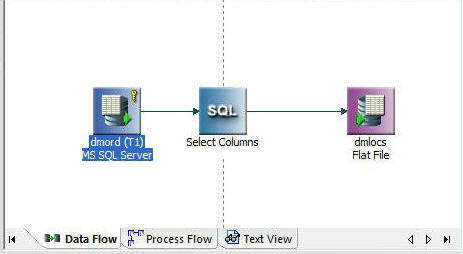 This simple data flow consists of a data source, an SQL object, and a data target, as shown in the following image. To add a data source object, drag a data source object from the list of synonyms in the navigation pane into the workspace, to the left of the SQL object. Select the columns that you want to extract from the source and copy into the target. Note: If Automatically select all columns is selected in the Data Flow Designer user preferences tree from the Options dialog box, you do not need to manually select columns. To add a data target object to the data flow, right-click the workspace to the right of the SQL object, select Add Target, and then click New. Save and submit the data flow.